Firefighters have tackled a blaze at a disused building in Bristol. An eyewitness said the fire ripped through the two-storey former workshops in King John's Road, Kingswood, early on Saturday afternoon. "Roof tiles were exploding and showering the firemen with asbestos splinters," he said. Firefighters tackled the blaze from outside the building after fears it had become structurally unsound. The cause of the fire is not yet known. 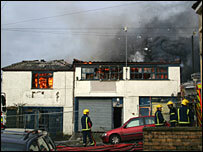 The building had been derelict for a number of years and was not thought to have been occupied. No-one was reported injured in the incident.